Sometime later, David allowed Absalom to come back to the palace. After two years, Absalom got himself a chariot with horses. Absalom would ride his chariot to the entrance of the city gate where people who want to bring their cases to King David have to pass their way. Whenever someone saw Absalom, he would bow down to him but Absalom would hug him and kiss him. Soon everyone loves Absalom more than they love David. David let Absalom go. Absalom took 200 men with him and offered sacrifices at Hebron. After that, Absalom sent for the advisor Ahitophel to come to him. A messenger told David, “The whole of Israel is now on Absalom’s side.” David and his men quickly left Jerusalem. David and his men went down the road. Shimei went along the hillside. Shimei cursed David and throw rocks and dirt at him. By this time, Absalom and Ahitophel had arrived at Jerusalem. So Absalom set up a tent on the flat roof and went in to sleep with King David’s wives one by one. When Ahitophel learned that Absalom did not listen to his plan, he saddled a donkey back home and hung himself. Hushai quickly go to Zadok and Abiathar and told them the advice Ahitophel had given as well as the advice he had given to Absalom. Jonathan and Ahimaaz were waiting at Rogel Spring for Hushai’s message. A maidservant went up to them and told them the message. A man from Absalom’s side saw them and reported them to Absalom. So Jonathan and Ahimaaz went and hid in the well at the house of a man in Bahurim. The soldiers went to look for them, but they didn’t find them so they left. Jonathan and Ahimaaz climbed out of the well and hurried to David to give him the message. After David and his men heard the message, they got up and crossed to the other side of the Jordan River. Then David stood at the side of the gate, while watching the army marching passed him in troops of hundreds and thousands. The war took place all over in Ephraim Forest. Twenty thousand soldiers died that day. More of the soldiers died because of the danger in the forest rather than the sword. Absalom was riding his mule when his hair got caught in the bough of a large tree.The mule ran away, leaving Absalom caught in mid air. Some of David’s soldier happened to pass by and went to tell Joab about it. 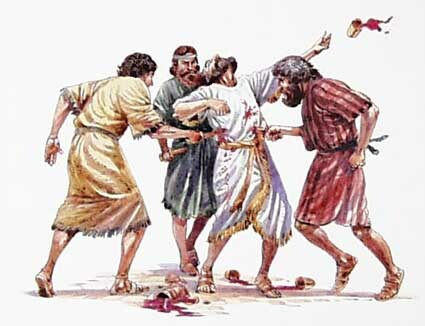 Joab answered, “I will not waste my time anymore!” Then Joab took 3 spears and stuck them into Absalom’s chest. Ten of Joab’s bodyguards came and finished Absalom.